Chicago is home to one of the most glamorous and oft-visited downtown districts in the entire country. The city’s Magnificent Mile offers countless scenic locations for your wedding photography session in Chicago. Begin your photo shoot at the luxurious Drake Hotel, the entrance of which will provide a great backdrop for a portrait of the entire bridal party. Venture inside and you’ll be greeted by the stylish lobby. Here, your wedding photographer can arrange the party beside the chic front desk, or along the railed stairs. Finally, the bride and groom can pose beneath the glimmering chandelier in the center of the lobby for a beautiful portrait. Once you’ve finished at the hotel, take a short limousine ride over to the Holy Name Cathedral, a popular choice for Chicago weddings. The entrance of this stunning Gothic structure provides two massive bronze doors, in front of which your wedding photographer can organize a portrait of the bride and groom. The groomsmen and bridesmaids can also pose along the cathedral’s stone steps. Walk through the doors and you’ll find yourself inside the most ornate cathedral interior in all of Chicago. Have your wedding photographer take photos in between the wooden pews, beside the elegant altar, or next to one of the cathedral’s beautiful marble columns. Your final destination on this itinerary will be Chicago’s famed Michigan Avenue Bridge, located only a few minutes away from the cathedral. After posing beside the marble sculpture at the gateway of the bridge, walk along the pedestrian section as your wedding photographer takes some candid photos. With the Chicago River flowing in the background, the Michigan Avenue Bridge will be the perfect place to finish off your wedding photography session in downtown Chicago. 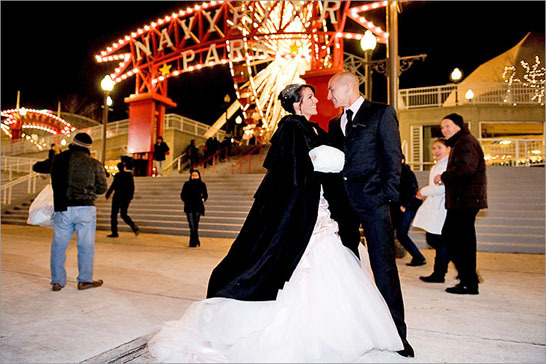 For the couple that prefers to steer clear of the hustle and bustle of downtown, Chicago’s world-renowned Grant Park and its adjacent Millennium Park offer a glimpse of nature, along with some of the city’s most gorgeous wedding photography locations. As you arrive at what is commonly referred to as Chicago’s “front yard,” you’ll find the largest, most verdant lawns that the city has to offer. After your wedding photographer arranges the bridal party for a portrait on the greenery, stroll over to the dazzling centerpiece of Grant Park - the Buckingham Fountain. Modeled after the architecture of Versailles, the fountain is surrounded by a “moat” of green grass, making it a perfect spot for some memorable wedding day snapshots. Once you’ve finished here, it’s onward to the Lurie Garden - a cluster of vibrant flower collections located at the southern end of Millennium Park. Explore and take in the colorful floral treasures as your photographer captures the beauty all around. Afterward, head over to the tree-lined Wrigley Square and take photos beside the immaculate Millennium Monument, whose towering Doric columns will make for some stunning photographs. These are just some of the picturesque wedding photography locations that you’ll find at Chicago’s most prominent parks! Besides being one of the America’s premier higher learning institutions, the University of Chicago offers a unique campus filled with great locations for your wedding photography session. Start off by taking photos on the lush green Harper Quad, located beside the stunning Gothic-style Harper Library. A short walk east will take you to the towering Rockefeller Memorial Chapel, where the bride and groom can pose beneath the elevated stone arches along the structure’s exterior. Head toward the interior of the University of Chicago campus until you arrive at Reynolds Hall, another marvelous Gothic-themed edifice that will provide a beautiful backdrop for a portrait of the bridal party. The bride and bridesmaids can also use the benches in the foreground of the building to rest their weary legs, making for some laidback wedding photos. Just a short distance from Reynolds Hall you’ll find the tranquil Botany Pond, surrounded by green grass and some benches, which your wedding photographer can use for an intimate portrait of the bride and groom (the little bridge that crosses the pond is also a perfect spot for a snapshot of the happy couple). If you have some spare time after your campus photo shoot, explore Washington Park and Jackson Park, which border the university to the west and east, respectively.